The Baltimore Orioles, who already lead the big leagues in every other category respecting the interleague traveling championship, finally added a championship with a rally through the late innings Sunday against the Tampa Bay Rays. Caleb Joseph went three-for-four Sunday and scored the winning run against the Tampa Rays, boosting the Baltimore Orioles to their first interleague traveling championship of the season (Keith Allison/Creative Commons Attribution-Share Alike 2.0 Generic license). The Baltimore Orioles, who already have a huge lead in title defenses and games holding the continental baseball traveling championship, considerably strengthened their hand Sunday. The Orioles came from behind for an 8-5 win on the road against the Tampa Bay Rays, taking two of three games in the series and claiming the title. The Rays had defended the title three times since winning it by snagging three of four at home from the Oakland Athletics June 8-11. The Orioles took the early lead Sunday, then lost it when Evan Longoria hit a three-run homer in the fifth inning against Chris Tillman, giving the Rays a 5-3 lead. Then, the Orioles picked and pecked to get the lead back, and the win. First, Trey Mancini homered in the sixth against Tampa Bay starter Jake Odorizzi, making it 5-4. In the eighth, Jonathan Schoop tied the game with a leadoff homer against Tampa Bay reliever Chase Whitley. Tampa Bay called on its closer, Alex Colome, in the top of the ninth inning with a 5-5 tie. It didn't stay tied for long. Caleb Joseph, who homered earlier in the game, singled to lead off, capping a three-for-four day. After Craig Gentry sacrificed Joseph to second, the Rays intentionally walked Seth Smith. The strategy backfired when Colome tried to sneak an 0-2 fastball down and over the plate past Joey Rickard. Instead, Rickard crushed a line drive down the left field line that bounced over the fence for a ground rule double, driving in Joseph with the lead run. Colome then issued an intentional walk to Manny Machado to load the bases before hitting Schoop with a pitch to force in another run. 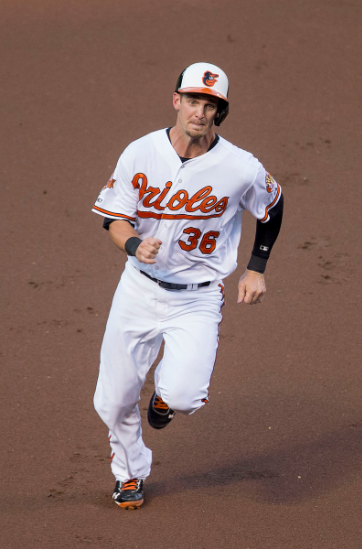 A sacrifice fly by Adam Jones gave the Orioles their final run. 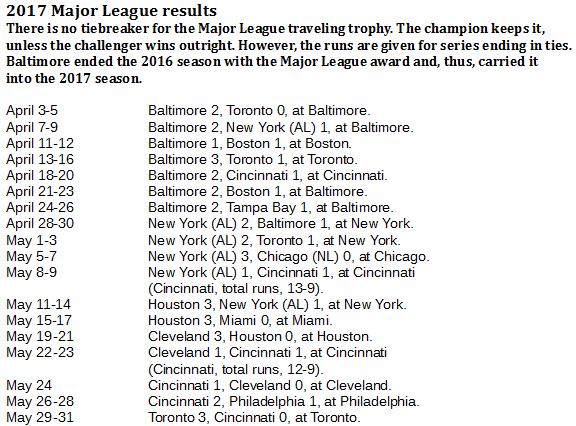 The Orioles began the season with the interleague traveler, having finished the 2016 season with it. Then the Orioles defended it seven straight times, holding it for all of April, before the New York Yankees took it away by beating the Orioles two of three in New York April 28-30. 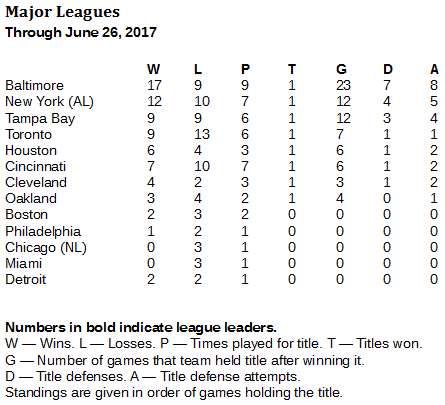 Now, the Orioles have a title for 2017, tying them with the other seven clubs that have one. But no one can match Baltimore's seven defenses and 23 games holding the title. The Orioles will attempt to build on those leads Tuesday through Thursday against the Toronto Blue Jays in Toronto.